Healthcare employment will have low exposure to automation in the next decade despite the increased use of artificial intelligence to replace some tasks, experts predict. January 30, 2019 - Increased use of automation and artificial intelligence is slated to replace millions of jobs and tasks in the near future. However, healthcare employment is relatively safe from automation, according to a new report from the Brookings Metropolitan Policy Program. The report, titled Automation and Artificial Intelligence: How machines are affecting people and places, looks back at how automation impacted the workforce from the 1980s to 2016 and offers projections on how new automation and artificial intelligence (AI) tools will affect the economy by 2030. 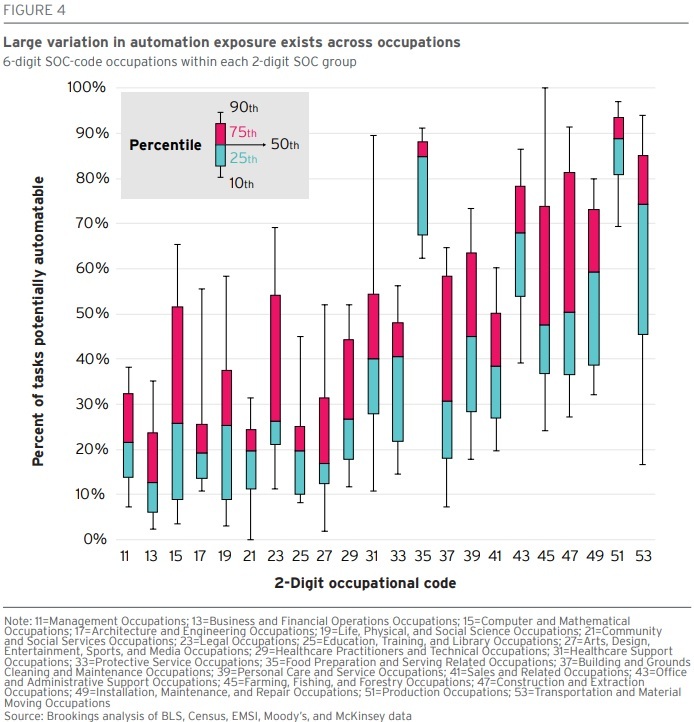 Muro and his co-authors Robert Maxim and Jacob Whiton found that only approximately one-quarter of US jobs (36 million positions in 2016) are at an elevated risk of automation in the coming decade. Meanwhile, about 36 percent of US employment, or 52 million jobs in 2016, face medium exposure by 2030, and the remaining 39 percent (57 million jobs in 2016) will experience low exposure. The healthcare workforce sits in the medium to low exposure buckets, the report shows. For example, home health aides only have an eight percent automation potential by 2030, while registered nurses have a 29 percent automation potential and medical assistants have a 54 percent automation potential. Additionally, healthcare practitioners and technical occupations have a 33 percent current-task automation potential and healthcare support occupations have a 49 percent potential. In contrast, jobs that are in “more cut-and-dried activity areas” such as office administration, agriculture, construction and extraction, maintenance and repair, production, transportation, and food services will experience the highest automation potential. In the middle are protective services, building and ground maintenance, and personal services, the report states. Despite different levels of automation potential, researchers emphasize that no occupation will be unaffected by the adoption of automation and artificial intelligence. Routine tasks will be the most vulnerable to automation in the next decade. Automation risk will be the most disruptive in the American Heartland, so Illinois, Indiana, Iowa, Kansas, Michigan, Minnesota, Missouri, Ohio, Nebraska, North Dakota, South Dakota, and Wisconsin, the report also stated. Similarly, smaller, more rural communities will also see significantly more automation exposure and task replacement compared to urban areas. In addition, the report states that men, young workers, and under-represented communities have greater automation exposure. Automation and artificial intelligence will impact the US workforce in the next decade. But the potential loss or task replacement for some occupation isn’t as dire as some say. Federal, state, and local policymakers, business, educators, and civil society have the power to ensure automation and artificial intelligence maximize productivity while mitigating negative labor market effects, they add.